Liquid glitter eye shadows are one of the hottest makeup products around at the moment, and many brands are releasing their own version. Beauty Blvd have recently launched their version, the Molten Metal Glitter Eye Shadows and I thought I would give you the low-down on them. There are six shades available, including pinks, golds, silvers, greys and rose golds, and so there is a shade to suit all skin tones. 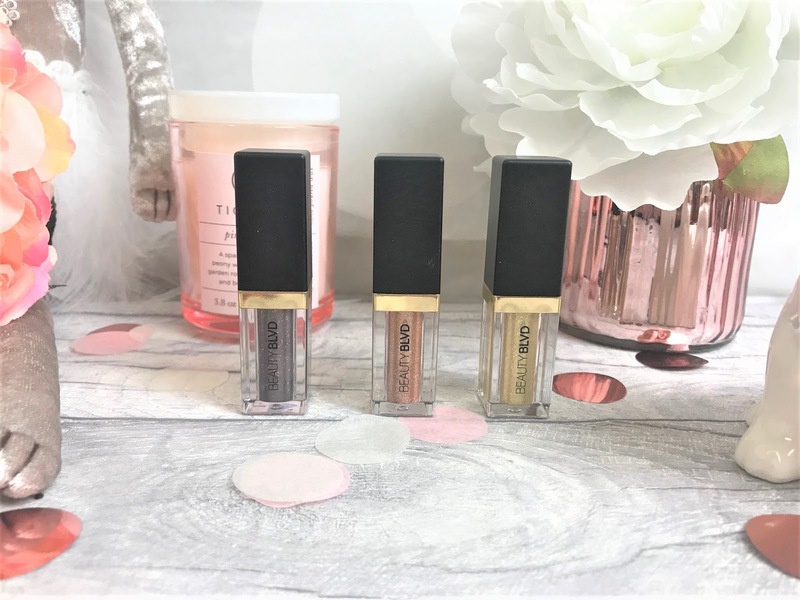 Beauty Blvd are well-known for their glitter products, and they have done an amazing job with these liquid eye shadows. The shadows come packaged beautifully and the tubes which hold the shadow isn't dissimilar to Stila's liquid eye shadows. From just one swatch, you get the most amazing shimmer and sparkle, which make the perfect middle-lid highlight, or you can layer them to go full-disco. Even though the formula contains glitter, the shadows are still creamy and you can't feel any irritation from the glitter. Once applied to the lids, I find that they dry down quite quickly, which for me is brilliant because I have hooded lids, and so when using liquid products I have to be really careful or it transfers everywhere. 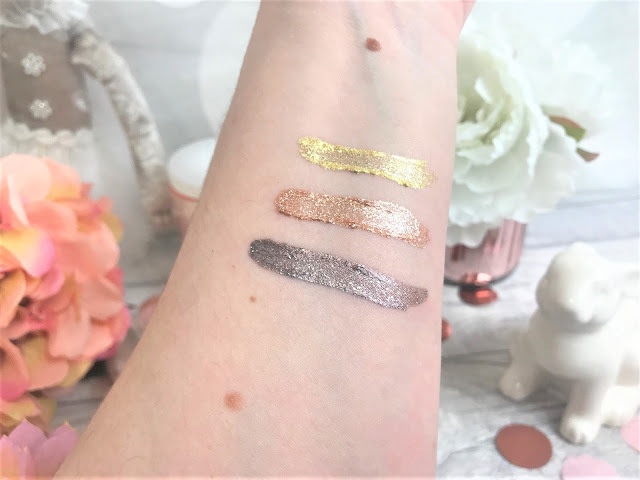 I was kindly sent three shades to try and we have Adelize, which is a dark, smoky grey with pretty gold flecks of glitter, Emelisse, a light rose gold shade full of silver glitter, and Ysmeina, a light champagne gold with silver glitter. The applicator is made from sponge, and picks up a good amount of product, making it easy to work straight from the applicator, or you can go ahead and use a brush. 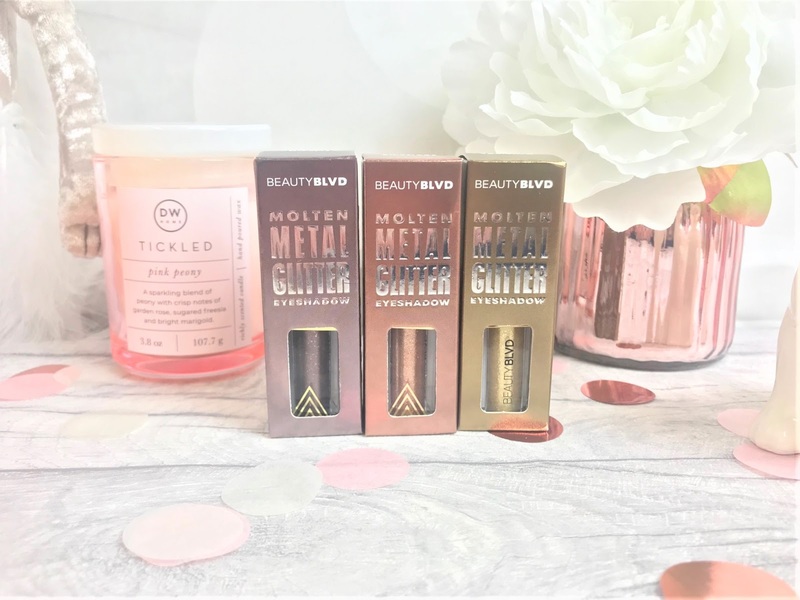 The Beauty Blvd Molten Metal Glitter Eye Shadows cost just £10.00 each, which is very affordable compared to other brands, and you can find them online at Beauty Blvd.